Bar de la Relève is located just 5 or 6 blocks from the Vieux Port but the steep hill climb that connects the two keeps the neighborhood a bit sheltered from the crush of tourists (by the way, stop at the medieval Abbaye de St.-Victor for a quick look as you pass…the crypt is a jaw-dropper!). A sort of bar/cafe/tapas bar a la Marseillais, Bar de la Relève was started by a group of copains who had already made there mark on the local food landscape ( Edouard of the Bistrot d’Édouard, Arnaud from the Cafe des Epice, Hugo from Le Cave de Baille and Gregoire, locally famous for organizing food-centric “happenings and soirees”) but who longed for a friendly place to meet friends, raise a good glass of wine and have a bite. They found the perfect location in an ancient and long abandoned café du quartier, that had, in its day, been a favored haunt for taxi drivers. 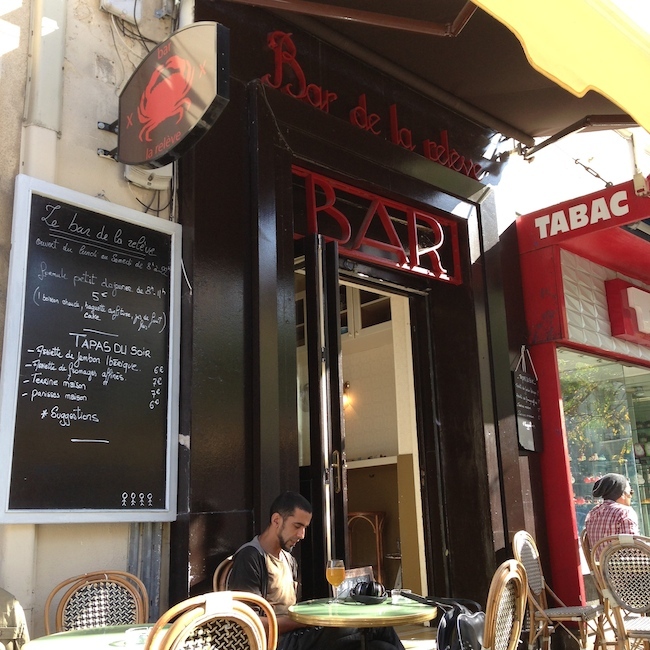 After an extensive and charming renovation, Bar de la Relève was born. On any given night the front room is thick with neighborhood habitues crowding around the bar and spilling out onto the sidewalk, engaging in animated discussions between glasses of wine. Don’t worry, speak to the kind gentleman watching over the door, get on the list for a table and then wade right into the crowd. The people of Marseille have a well deserved reputation for friendliness. Once at table (or on any tiny scrap of bar you may happen to conquer), the menu is full of small plates that work as a snack or can be strung together for a meal. On one night: panisse, a sort of Provencal fritter made from chickpea flour, fried and simply served with sea salt and a lemon wedge; squid hoods stuffed with green chard and braised in pastis, tomato and white wine; filets of lieu jaune breaded a l’anglais served with sauce tartar; a robust country pâté; and a lovely salad of roasted winter vegetables. Côté vin, a well selected list featuring natural and organic wines, most by the glass. What else could you need? Reservations: Not accepted, come early or just push up to the bar until a table in the small dining room opens up. Pleasant terrace for warm days or nights. This entry was posted in Restaurants and tagged Bars, France, Restaurants. Bookmark the permalink.